Say 'Hi' to the new redesigned and improved Sync Metronome (old Bluetooth Metronome). Now more accurate than ever! With a minimalist design and simple interface, Sync Metronome is a professional metronome with all the necessary functions to make you find it useful and easy to use. But with a feature which sets it apart from most: synchronization. With this feature, Sync Metronome is able to synchronize with one or more iPhone / iPad, which have Sync Metronome installed making everyone goes at the same time. Imagine you are recording something with your group or ensemble and you need a metronome to see or listen to everybody goes together. Or you have an ensemble and when you rehearse your sound is so loud that you cannot hear the metronome. With this app you will find it easier: each person has to run Sync Metronome and tap the Sync button, turn On Bluetooth / Wifi for all devices, and the app will automatically synchronize them all! For news and promotions follow us on Symponic Apps Facebook page! Minimalist design. Very easy to use. Professional, high accuracy with the tempo. 3 beat types. Set each beat to accent, normal sound or mute. Tempo subdivision, subdivide the tempo to quarter notes, eighth notes, eighth notes triplets and sixteenth notes. Templates function. Save and load up to 5 templates. 7 different beat sounds ready to be heard well. Tuning fork to tune to various frequencies: 415Hz, 440Hz, 441Hz, 442Hz and 444Hz. 3 different tuning fork tones. Sync to start and go together with other devices (internet connection is needed for best results). Tempo 20 to 240 beats per minute. 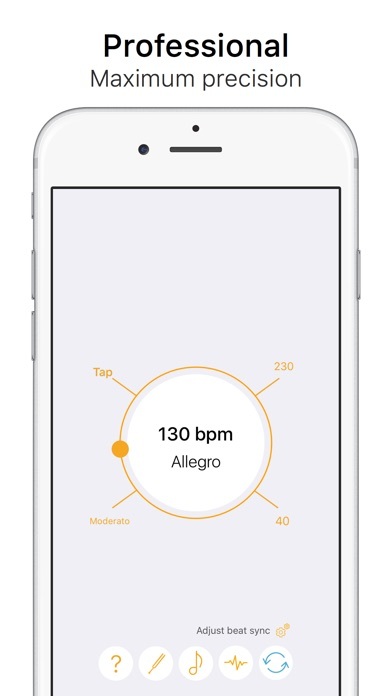 Control the metronome through the Apple Watch App.